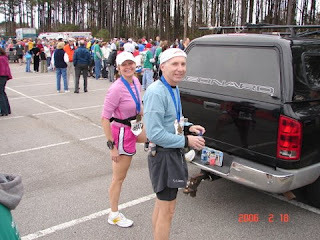 I am preparing to return to the Myrtle Beach Marathon this weekend with the usual suspects, Jerry, Karla and Frank. This will be my 3rd year in a row running there. The first year I only signed up to pace Karla in her first marathon along with Jerry. She went on to qualify for Boston in her first and I unexpectantly got a PR out of the deal. Last year it was my turn to try and qualify which I barely did by 45 seconds. I won't rehash the story of the special importance of these events here. A lot of you already know the story. For those that don't, you can look in the archives or click here for the whole story. There are links in this one to the first two parts. I wasn't planning to return this year but I told Karla if she was ready to run it as she begins rebuilding, I would run it with her. As expected she is committed to getting back stronger than ever. This will be her first since completing all her treatments now and we are looking forward to sharing the day again. Jerry will be running and as usual, Frank will be running in the half-marathon. We are trying to convince Frank he needs to start training to qualify for Boston 08. Our Friend Jenn, who I ran at the Frosty 50K may join Karla and I for the first half. She has been recovering from an injury and dropped down to the half. There will be a ton of folks from the Raleigh area and the NCRC. Mark Dowd and friends have planned a pre-race pasta dinner and had 118 people sign up. You can check out the race website here.